Philly Zeen: Who Are These Guys? 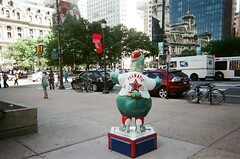 All summer long, strange and goofy-looking creatures have been seen on the streets of Philadelphia. Who are they? Why are they here? How long do they plan to stay? I'm told that, wherever they're from, and whoever they may be, they've developed a fascination with the sport of baseball. Understandable, I guess, consideriing the success of the Phillies.